On 16 June 2009, Steve was diagnosed with mesothelioma - an aggressive cancer caused by exposure to asbestos, for which there is no known cure at present. This blog is my record our feelings, our actions and the outcome of our attempts to deal with this disease. If nothing else, it will be a way to let family and friends know what's happening. I hope that sharing this experience will help others in this position and raise awareness of mesothelioma. You can bang on for years, trying to raise awareness about something important, but generally the only people who listen are family and friends, and those with a specific interest in the subject you blog about. As far as the national and international media are concerned, you do not exist. But there are exceptions to that generality and one of those is fellow meso blogger, Mavis Nye. 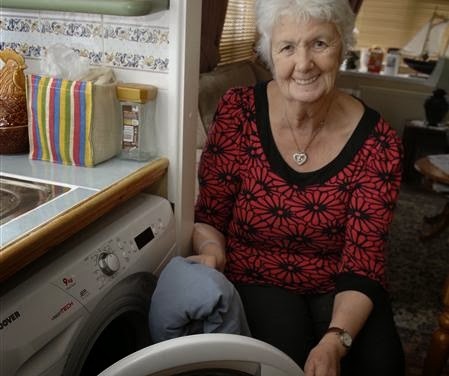 Mavis writes a daily blog Living with Mesothelioma (link on the right) which has attracted attention far beyond her wide circle of friends in the mesothelioma and motor home communities. Likewise, the number of people following @grandmamavis on Twitter is rising steadily. Mavis works really hard at reaching out to people. I don't know how long she spends each day sitting in front of the computer sending and reply to e-mails; posting and commenting on Facebook in groups and private messages; writing tweets; publishing her daily blog and such like, but it must be a long time - she is so productive! It has paid off in the past, with features in the local and national press, but recently Mavis has hit the national media big time. Back in January, she was interviewed on the BBC Politics Show, talking about the new Mesothelioma Bill. She was recently invited to tea with the Director of Corporate Development of Verastem Inc, a major American drug company which is working on the COMMAND clinical drug trial here in the UK. More recently, and at his request, she found herself sitting beside Lord Saatchi at the first "Google hangout" televised in the House of Lords on Monday to launch the Saatchi Bill (Medical Innovation Bill). No wonder she was awarded the Asbestos Diseases Awareness Organisation's Alan Reinstein Award for her commitment to education, advocacy, and support to countless patients and families, and the Independent Asbestos Training Providers (IATP) Meso Warrior Award in 2013. Where can she go from here, I wonder? Read the local press article here! Mavis has what we need to raise awareness of this awful disease. Someone who is living through it, helping others all the time while she desperately seeks the answer to the question what next for herself? Mavis has already had four chemo regimes and her "Mr Nasty" is growing again, albeit slowly according to her last scan back in December 2013. She has exhausted all the usual options but is still willing to put herself forward for innovative treatment, so is a prefect person to help front the Saatchi Bill campaign! But rather than use today's post to say goodbye to another brave warrior, I'm delighted and proud to dedicate this post to someone who is still full of life and determination. Well done Mavis, meso warrior queen!